This past week you may have noticed penguins taking over your Instagram or Twitter feed as World Penguin Day was celebrated on April 25th and proved once again that pretty much everyone, everywhere loves penguins. Penguins are without a doubt the most sought after wildlife viewing experience we offer at Southern Explorations, and it’s no mystery as to why. Across the 17 species of penguins, all of which are found in the southern hemisphere, the flightless marine birds appeal to us in so many ways. All but two species of penguins breed in large colonies made up of thousands upon thousands of birds – some are even detectable from space - making for incredible photography opportunities. Their life-long mating tendencies in most species, their shared responsibilities by both male and female penguins to care for their young, their adorable puffy-feathered chicks, and their general lack of fear of humans make them endlessly engaging. They appear to be clumsy or slow moving on land but shoot off like torpedoes in the water, they delightfully toboggan their way across ice and snow on their bellies, they demonstrate incredible feats of stamina, strength, and resilience to survive the harsh conditions so many of them face, and they look pretty sharp with their well preened and countershaded black and white feathers, all adding to their universal appeal. As extremely social creatures, we relate to their struggles and victories, as was brilliantly illustrated in the documentary ‘March of the Penguins.’ And yet despite their tremendous appeal to people, the very survival of penguins is now threatened. 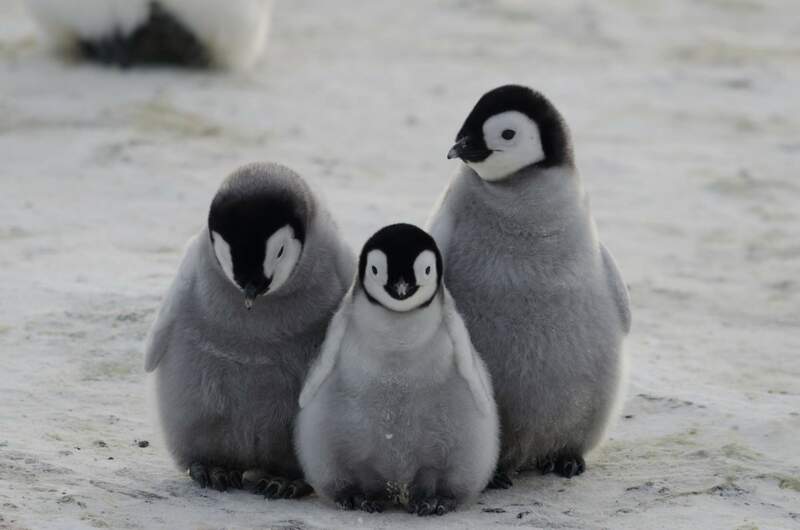 Penguin populations have decreased by nearly 80 per cent in some areas, according to Defenders of Wildlife, and a majority of scientists point to the rising temperatures due to climate change as the primary culprit. As Antarctic ice coverage disappears, penguins are finding their habitats greatly reduced and critical food populations – such as krill, which depend on the ice for reproduction – deeply depleted. Today, 10 of the world’s 17 species of penguins are classified as threatened with extinction. Just this year, a new study by Nature Climate Change warned that the king penguin, the second-largest penguin to the Emperor, faces serious threat from global warming as they are having to travel increasingly massive distances from their nests on the islands near Antarctica to their food sources, endangering the lives of their chicks, who already fast for more than a week at a time while their parents forage for fish and krill in the Antarctic waters. As the distance between food sources and the nesting regions increases more and more penguin chicks will succumb to starvation, threatening as much as 70 per cent of the 1.6 million estimated breeding pairs of king penguins this century. In addition to global warming, penguins are being killed by oil spills, pesticides, over-fishing, and rampant coastal development, all putting the very survival of the penguins at risk. This is one of the reasons we’re a proud member of the International Association of Antarctic Tour Operators (IAATO), a member organization that promotes and advocates the practice of safe and environmentally responsible travel to Antarctica. Through the organization, we adhere to a series of specific rules and regulations for our many penguin viewing experiences as delineated by the IAATO Birdwatching Guidelines. These include ship viewing and our onshore encounters with penguins, as well as direction and best practices for what to do if a penguin finds its way onto a small boat when they “porpoise” land on the deck. Witnessing penguins in the wild is a truly unforgettable experience, and we hope to be able to continue providing our guests with incredible penguin watching trips well into the future. In order to do so, we all have to do our part to help ensure the lovable penguin has a rich future that we can all enjoy.